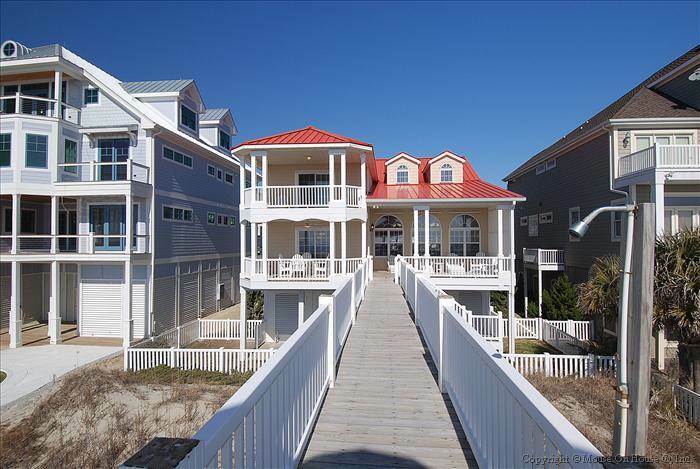 "Red Top" Luxurious Ocean front 5 bedroom and 5.5 bathroom home on the beautiful west end of Ocean Isle Beach in Island Resort. This home boasts a huge kitchen with beautiful granite counter tops, 2 dishwashers and wet bar. An open floor plan with a large living room with a 75" flat screen TV. Tons of windows to capture the incredible ocean views from almost every room in the house. Plenty of space with 5 bedrooms including a large master suite on the top floor with a 55" flat screen TV and private balcony overlooking the ocean. You'll appreciate your own private lighted walkway to the beach and a lovely gazebo perfect for watching the sunrises and sunsets. Furnished covered porches along with a Char-Grill and outdoor showers. NEW OWNERS with many updates/upgrades and TLC. Microwave, new washer and dryer, TVs and decor. Downstairs: (2 bedrooms) King, Queen/Twin, with 2 private baths and a powder room. Upstairs: (3 bedrooms) King, 2 Queens, 2 Queens and 3 private baths. 2 pullout sleeper sofas in downstairs living room. Linens for baths and bed provided. Wireless internet access. Islander Resort Oceanfront Beach Club privileges include swimming pool, jacuzzi, bathrooms, and sunning decks. Love this beach house and OIB! We had a great beach vacation and this rental was perfect for our group of 10. Had plenty of space to spread out and really enjoyed our time here. Definitely will recommend this house. Really enjoyed staying on OIB for our annual golf vacation. A great island, and being right on the beach was perfect. The house is very well maintained with plenty of space for all of us. Did not see any stains or scuff marks that I tend to find in other vacation rentals. Very clean and modern. Super fast Wi-Fi when I had office work to do. Will definitely rent again, and highly recommend this house (and Sloane Vacations) to others. We have thoroughly enjoyed our stay here. This is such a nice house and we really have appreciated the opportunity to use it for this week. This is a great island and the people here are extremely nice. Thank you so much!! We really enjoyed our vacation to OIB. Our rental house was perfect for our family with the ocean only steps away and the nicer part of the island to ride bikes. We found the house very clean and nicely decorated. Really appreciated the stocked kitchen. Looking forward to coming back next summer. Wonderful beach house, great location Really liked the updated dcor and fresh paint, carpet, and bedspreads. A tremendous value for a rental right on the beach Already booked my weeks for 2015. Book early if you want a certain week.